D G Fires & Fireplaces - Fireplaces/Stoves based in Bournemouth, Dorset. 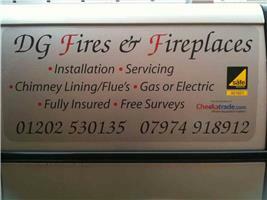 DG Fires & Fireplaces was set up in April 2008. After 12 years working for a fireplace shop I decided I would like to 'go out on my own! With over 22 years experience installing gas fires/fireplaces stoves and electric fires I have Vast experience in all aspects, I have ensured my Gas/Hetas training and registration's are always up to date including all public liability insurances, From a free site survey to installation you will receive a friendly professional service,designed to your own needs and requirements all with a personal touch. As this is my own company I do all the work myself so you are always guaranteed the personal touch. I ensure the work I carry out is always to a very high standard. Poole, Bournemouth, Christchurch, Ferndown, Southampton, Hampshire, Dorset,Salisbury,Wimborne.